The Turtles pull into the Intergalactic Wrestling Federation headquarters on Stump Asteroid to collect the third witness: Stump. They arrive on the eve of Grappleganza, a main event where Cryin' Houn' will fact off against Antrax the Executioner. Stump, backed by his partner Sling, isn't interested in ditching his big promotion to go testify in Krang's trial. 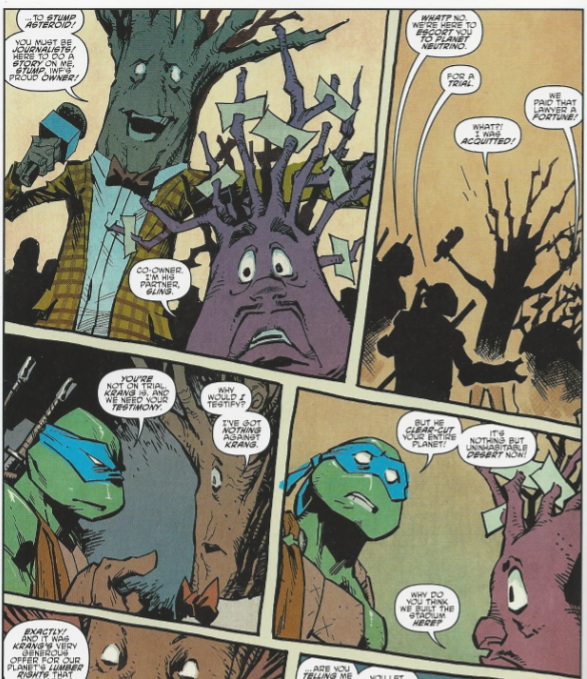 Leonardo reminds him that Krang clearcut his entire homeworld, but Stump reveals that he's the one who charged Krang for the lumber and made a tidy profit in the transaction. The Turtles are at an impasse until Stump suggests that Raphael play a heel in Grappleganza and lose to Antrax in the opening match. Raph reluctantly signs a contract to appear in the match, while Michelangelo enthusiastically signs on as his manager (oblivious to the fact that pro wrestling is rigged). Raph proceeds to face Antrax in the ring and, defying Stump's orders, defeats him. Stump feigns anger (having actually paid Antrax off to lose) and refuses to leave his asteroid since the Turtles broke their deal. 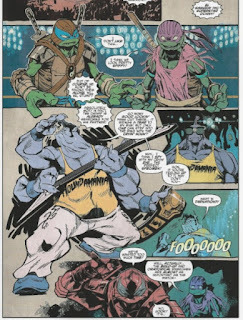 To make it up to him, Leonardo and Donatello offer to face Cryin' Houn' and his unknown partner in the ring and throw the match as planned. Leo and Donnie become El Samurai and Superstar Donnie and enter the ring. However, before Cryin' Houn' can call his pre-selected "surprise" partner from the audience, Hakk-R teleports into the middle of the ring, ready to attack Stump. The Turtles and Cryin' Houn' take on Hakk-R and Donnie gets the better of him by finding the one part of his body that remains solid even when he shape-shifts. Hakk-R taps out and then teleports away. Stump then takes to the ring and tells the crowd (confused as to why Cryin' Houn' attacked his own partner) that he's fed up with their mouth-breathing antics and is taking Cryin' Houn' to a more sophisticated venue. The crowd gets ugly and the Turtles barely make it to the Hot Rod with Stump and Houn'. In the Hot Rod, Stump explains that it was all showmanship: Sling will stay behind and build Antrax back up, then he'll return with Cryin' Houn' and it'll be a multimedia event. He then reminds the Turtles of the contracts they signed and that they'll be obligated to participate in that big return match. Mikey expresses excitement when Raph finally snaps and tells him that pro wrestling is fake. Cryin' Houn' takes offense to that accusation and attacks Raph. *This story is continued from TMNT: Dimension X #2. The story continues in TMNT: Dimension X #4. *Not that I REALLY have to point it out, but this whole issue is a throwback to TMNT Adventures #7. 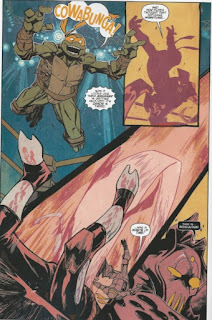 *Dask is shown flying the Hot Rod at the start of this issue, even though he was supposed to be staying behind on Neutrino as per TMNT (IDW) #73. While the obvious No-Prize would be that he decided to join in when they dropped off the last witness, Dask talks with Zak's faux-beatnik lingo, so it's more likely an art error. *This issue was originally published with 3 variant covers; Cover A by Nick Pitarra and Chris Chuckry, Cover B by Khary Randolph, Incentive Cover by Kevin Eastman and Tomi Varga. While I've never been a big fan of wrestling, I always did like the space wrestling stuff in Archie's TMNT Adventures. It was spontaneous and bizarre when introduced, but later proved to be a key part of the book's developing mythology. The characters and setting would become a recurring aspect of the series and often take center stage in major storylines. Looking back, the space wrestling was a very important part of TMNT Adventures. Damn, that book was weird. So an entire issue of Dimension X dedicated to revisiting that concept was just what I was looking for. In fact, this issue seems to be the centerpiece of the Dimension X miniseries (both figuratively and literally). 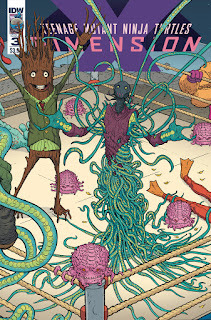 The interconnecting Nick Pitarra covers are all themed around the wrestling setting and I don't think I'm out of line in suggesting that this was the story fans were most looking forward to in this miniseries. Issues 4 and 5 are going to have a hard time topping this one. While the homages are all very direct, writer Aubrey Sitterson puts a fresh spin on things, playing with the pre-determined results of pro wrestling matches and balancing them with the faux-spontaneity of "sudden upsets". In the Archie series, the fights were staged as genuine battles with no set winner or loser, but this incarnation of the scenario is a bit truer to real pro wrestling, albeit with ant-people and Elvis-dogs. It seems more well-versed in the antics of pro wrestling, from the manager jumping into the ring, to a tag team turning on each other, to the face getting full of himself and acting like a heel, and so on. It's well-researched. We get a bevy of familiar cameo characters in this issue. Antrax being a wrestler rather than Krang's executioner was different, but I liked the angle. It keeps the parts of the character that make him recognizable as Antrax but changes things up just enough to keep him fresh (and without going into "in name only" territory like the Antrax that appears in the Nickelodeon cartoon). Cryin' Houn' being an Elvis parody was one of those things that SHOULDN'T have surprised me (because, well, his NAME), but I didn't see it coming and it got a good chuckle out of me when it happened. A definite change to the character, but an improvement over the Tasmanian Devil-looking guy that just mumbled "My name" over and over again. 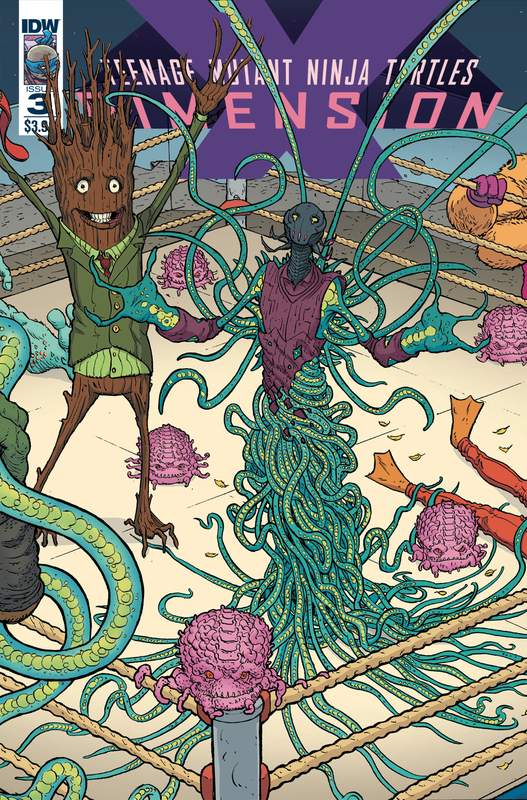 Khary Randolph and John Rauch have a great rapport on pencils and colors with this issue. Randolph's layouts are very heavy on perspective, with a lot of "looking up" and "looking down" angles. It's awesome because it gives you a sense of scale when one wrestler towers over another or when one character leaps into the ring and is coming down with an elbow drop. Rauch's colors, meanwhile, give you that sense of center ring spotlighting. Characters in the ring tend to be bathed in red and orange, while characters outside the ropes have drearier colors with highlights to make them blend into the shadows but still recognizably stand out. I think the only thing getting dull is Hakk-R. Since his introduction in the Free Comic Book Day prelude, he's been repeating the same shtick of popping up, bothering the Turtles, then teleporting away when things look bad. I do like that the Turtles are getting the hang of fighting him and he isn't as much of an overpowered threat as he was when introduced, but that's also turning him into more of a nuisance than an arch-enemy. That aside, this was my favorite issue in the miniseries so far. And as I said when I opened this review, I think it'll be hard to top. Rejoice! The solicit for issue 4 says its all about the turtles meeting Ace. Oh you better believe I'm rejoicing! It's kind of funny that Antrax is supposed to be "Krang's royal executioner" but no series has really used him that way. In the original cartoon he only appeared in 1 ep filled with other villains so he didn't get to do much and just acted as a one-shot villain. 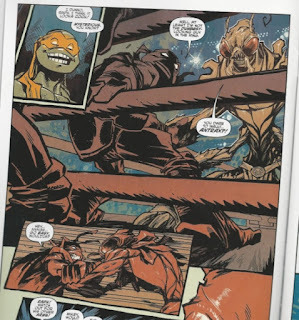 In Nick he was a bug mutant, and now in IDW a wrestler. He's one of those weird characters that has existed in the franchise for more than 20 years, but is bizarrely underused. I get the feeling IDW's Antrax will never appear again after this issue either, and was just a one-issue nod toward fans and nothing more. It's kind of like how Ace Duck has never had a proper cartoon appearance (even Nick completely passed him over), and just got turned into a wrestler which is nothing like his toy debut depicted him as. There's so many oddities the way these C-tier TMNT characters are treated in all the different series. Also, dig that crazy Flaming Carrot cameo. Hey. Sorry to go off topic but I was wondering I you had picked up tmnt artisan edition for review? I have it on my Amazon queue, though I'm not sure when I'll be picking it up. Hakk-R is the Team Rocket to the TMNT's "Gotta Catch Em All" roundup of witnesses.